The tracking posts on this blog raised some questions I would like to answer. Some asked if they could start with tracking for search-and-rescue. And some questioned if treats laid down on the track itself is proper tracking training. Before I can answer these questions, we first need to clear something up. Basically both questions reveal the same misunderstanding. 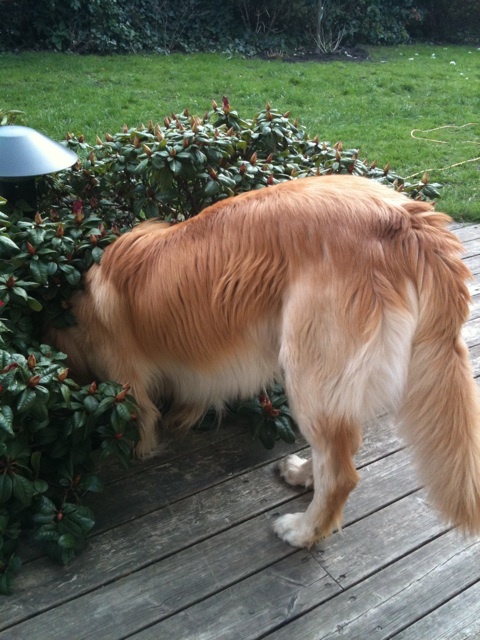 "Tracking" is a commonly used term for dogs following a scent. But sometimes tracking is not tracking. There are different styles involved. These styles are air scenting, trailing and - actual - tracking. 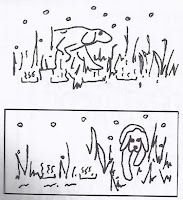 Each style fits the task we want the dog to perform. With air scenting the dog focuses on air born rafts. This is used when there is no specific track - like when you are searching for drugs, money etc. Or in rescue situations, like searching collapsed buildings for survivors. 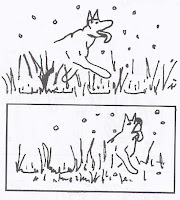 With air scenting the dogs usually scent for a specific category of scents, not necessarily individual scents. When searching for a missing person, the point is to reach that person as soon as possible. Even when the track itself already has evaporated. 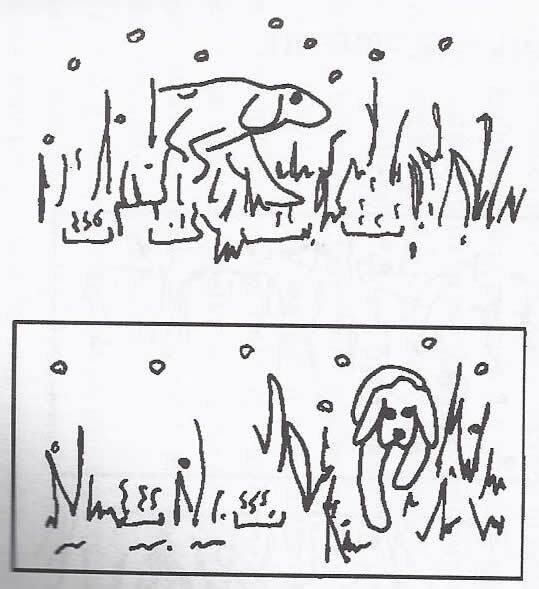 Sometimes following the exact track or trail is not the fastest way to get to the person, as the picture on the left illustrates perfectly. Air scenting would still give success in those cases. 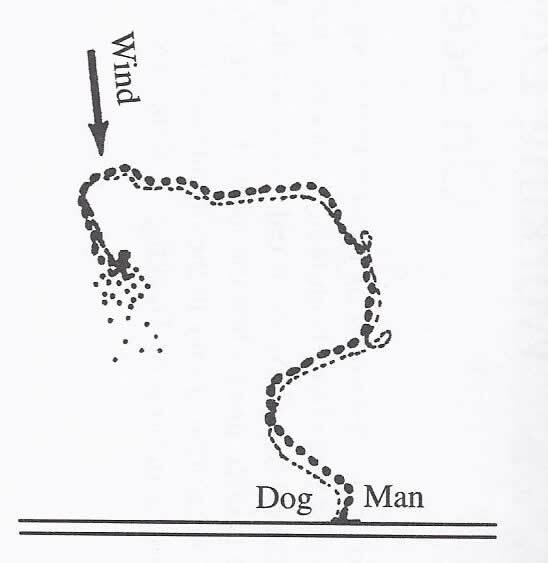 With trailing the dog is focused on the rafts of a particular person that have fallen down along that person's route. They sniff for an individual scent belonging to an individual person. Because of the wind they usually follow the track close, but not exactly. 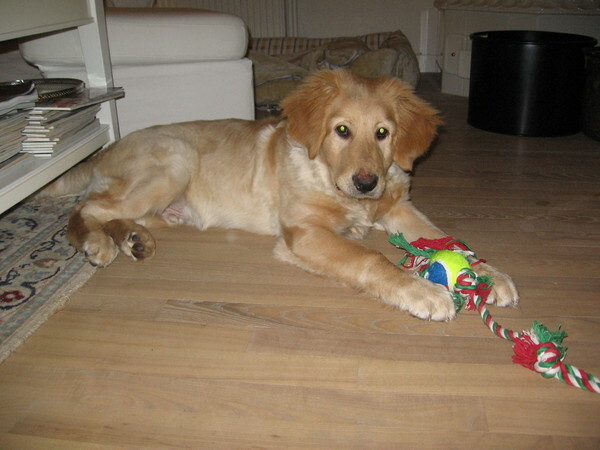 Dogs can trail quite fast and trailing is therefore ideal when the goal is to reach the person as soon as possible. 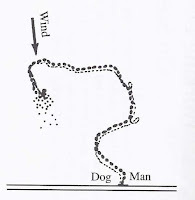 With trailing the handler usually has a scent article of the lost person they want the dog to find. We not only want to to find "a" person, like when air scenting, but also want to find the exact person we are looking for. They should be able to pick them out of a group if necessary. 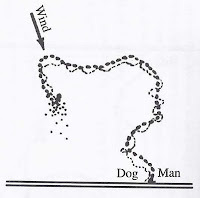 With tracking we want the dog to slowly and methodically follow the exact track of a person and indicate the objects they find along the track. They focus on the ground and use deposited rafts and disturbed surface to follow the track. This gives the characteristic nose down posture we know so well. 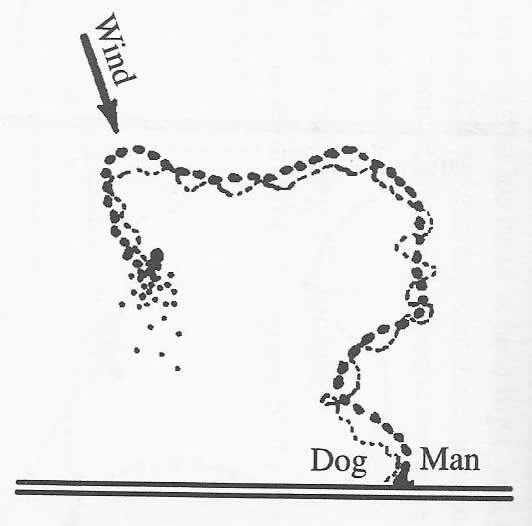 Because the scent of a disturbed surface sustains a lot longer than human scent, tracking dogs have the ability to follow the oldest of tracks, from which human scent already has disappeared. In K9 police work tracking is used as they also set out to find any evidence a criminal might have "lost" along the way. Finding evidence is almost as important as finding the criminals themselves. There is no "best" way. But depending on the task at hand, one of the specific styles will fit best. Dogs can master multiple styles. Which brings me back to the first question. Can we teach our dogs tracking for search-and-rescue? The answer to that would be a no. When we are searching for a missing person, we want to find them fast, and a tracking style is too slow to be an option. When there is still a track available we can use trailing, or when too much time has past and the track has evaporated, we can use air scenting. On the second question about using treats on the track during training sessions, the answer would depend if we are talking about trailing or tracking. 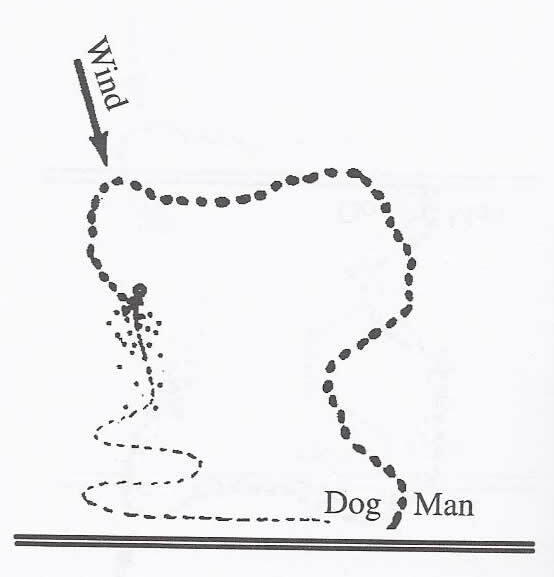 With tracking, treats on the track are needed to learn the dog to slow down, and also to let the track itself become the reinforcer. 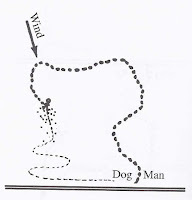 When the reward would first come at the end of the track, all dogs would rush ahead to get their reward. Using treats on the track and no reward at the end creates trackers - no treats on the track and a reward at the end creates trailers. What do you think? Does it make sense to follow only trailing or air scenting style in search-and-rescue? And what is your opinion on using treats when training tracking? 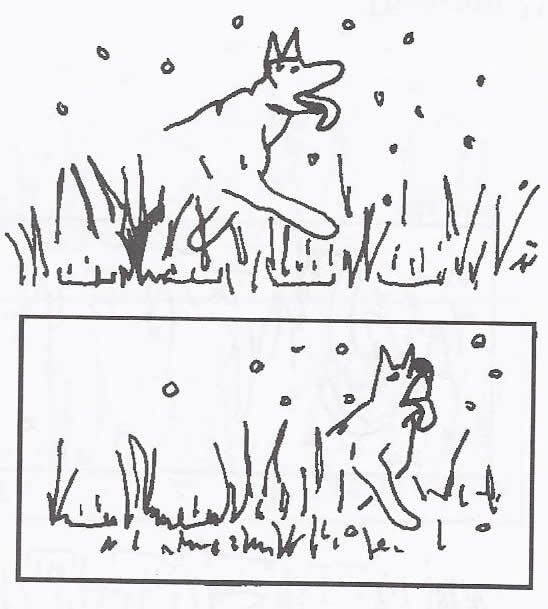 All illustrations are from the excellent book about scent, "Scent and the scenting dog" by William G. Syrotuck. If you want to know more about the world of scent this is definitely the book to read. It is obligatory material on police K9 training schools. 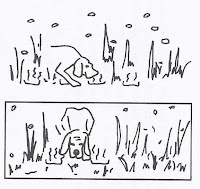 It is not so much a training manual, but more a thorough description of what scent is all about, and what your dog can do with it. After you have read this book, even a routine dog walk will never be the same. Welcome to the dog's world of scent! Don't you hate it when people don't clean up after their dog? I do. And so does Amy Burket from GoPetFriendly.com. Last Friday Amy launched a great initiative, "I am The Poop Fairy", as her contribution to Blog The Change. Amy is a firm believer that you shouldn’t complain about something unless you’re willing to take action to make it better. In addition to picking up after her own dogs, every day this quarter Amy will pick up at least one doggy deposit that does not belong to her dogs. I will join Amy in her "I am the Poop Fairy" initiative and hope you will too. Why? Because two years ago, poop that was not scooped almost became fatal for Kenzo. He contracted the "French heartworm" - angiostrongylus vasorum. Little devils that use poop and slugs as intermediate hosts. Although a rare heartworm, they are present all over the globe, though mostly in Western Europe and Canada. They follow the poop. No kidding. It is fatal for dogs. The worms reproduce inside the heart and travel from there through all the organs in your dogs body - see this animated video. They eat your dog from the inside out. As soon as you notice the hemorrhages around the eyes and gums, and blood in their poop, it is already too late. Internal organs have suffered fatal damage. In Kenzo's case, it started when we got a letter from our vet informing us the French heartworm was on the loose in our local area. She had a case of a dog with the French heartworm in her pratice and adviced all of her clients to be tested for the heartworm. We had to leave for a trip to Holland - Kenzo included - at the end of that week, but I delivered the necessary poop samples of 3 consecutive days to our vet before we left. If something was wrong she could call us. I was not the least worried and did not give it a lot more thought. One of the days I had problems with incoming calls from Denmark that were disconnected before I could answer them. The same day my wife called that Kenzo had started to cough up white slime. It looked and sounded a lot like the Kennel cough. First thing I did was to call our vet in Denmark. As you probably already guessed, it was her that has been trying to reach us as Kenzo's test turned out positive. And she was really worried when she heard he was coughing up white slime. The white slime was filled with French heartworm larvae causing inflammation in his lungs. 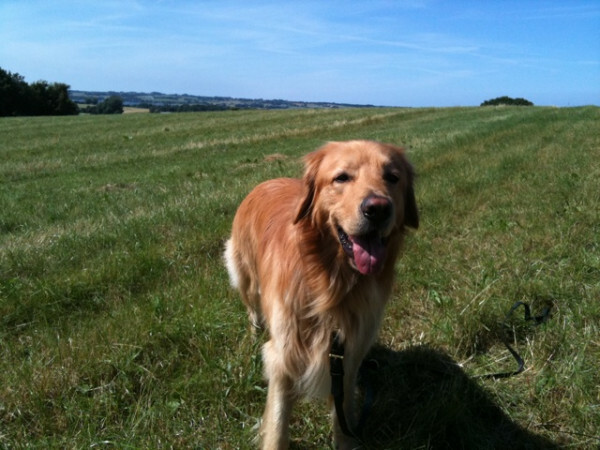 The prevention and cure for the French heartworm is the same: Advocate / Advantage Multi. But I had to get it A.S.A.P. Like in yesterday. We could still have a chance to prevent damage to internal organs. Getting a Dutch vet deliver Advocate - a prescription drug in Holland - on such short notice was not easy, but my vet was a great help and send faxes to their office explaining what we needed it for. Kenzo got his Advocate that same day. A necessary evil, as it kills the worms, but the body has it difficult to cope with all the dead foreign bodies at once. It doesn't always have a happy ending. The little guy now quickly felt very sick and it started to show. It took two days where he didn't do a whole lot more than laying down. But on the third day, he stood up again. Kenzo made it ! It was a close call. In addition to picking up after your own dogs, will you pledge to pick up one pile of unclaimed poop? Could you do it every day for a week? Anyone brave enough to join Amy and me for a month? If you’ll commit to picking up with us every day for the quarter, you are Amy's hero. And Kenzo's as well. We may have to start a club – this could become a movement. Who’s with us?!? We learned so much about tracking on nosework camp, now almost 2 weeks ago. Where to start without boring you with all the technical tracking details? 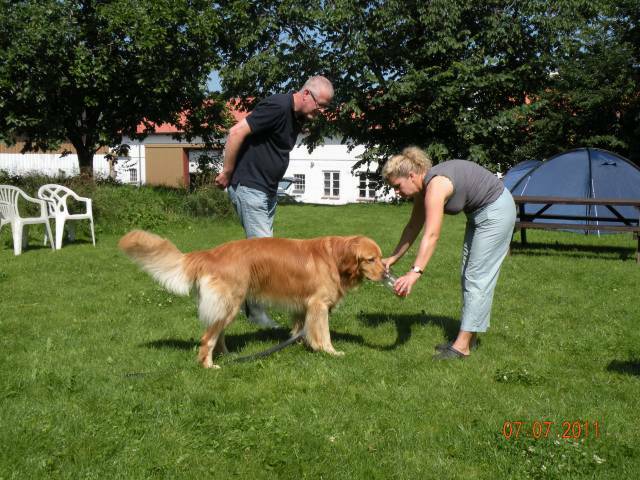 I could write a thousand blogs about everything we learned from Vibeke Gyldenkærne, our tracking trainer on nosework camp. Trying to stick with the headlines of the tracking part of our nosework camp what does all I learned from Vibeke boil down to? Well, ahum. I have been moving ahead too fast. I know, I think I wrote in almost all of my former blogs about tracking "don't move forward too fast". And despite preaching that, I stumbled, tripped and fall down myself. So we start from scratch again - sort of. And the good news is Kenzo is picking up like never before. Meaning I will still bore you with those thousand blogs. At least. Just not all at once. Kenzo and me are tracking again and we are happy about it. Here is a short video we took after camp, rehearsing with Kenzo that tracking is all about following the footsteps. As this is the last installment of the nosework camp series, I want you to know Kenzo didn't only work, he had a lot of fun as well - and also made a lot of new pals. Qipoe the BC, Kiwi the Toller and Sally the Lab are some of his new favs. There was even another Hovawart in the group. And we are going to meet him again on the international Hovawart show coming in September. Reminding me we have one more project this year, Kenzo is going to participate in his first dog show! Last but not least, I can recommend everybody to spent a couple of days with their dog in some sort of camp this summer. Nosework, herding, agility, treibball, take your pick. It is an awesome experience to spent some holiday time together with your pet. One of the topics of last week's Nosework camp was scent discrimination. We could chose an item we would like Kenzo to search for by scent. Either an apple, a tea-blend, coffee, or something like money. Searching for money could quickly become expensive. You need bills with different amounts. New bills, old bills, etc. And as we already can search for marihuana, adding money to our curriculum could also give some the wrong impression. So we went for the apple. To train scent discrimination you need a couple of tall glasses or cans. One of the glasses contains the apple, the others contain something that looks like an apple - sort of - like plums or oranges. You might wonder why the tall glass? Simply because we don't want them to think it is an exercise "how to get the apple out of there and eat it". What we want to achieve is to present the glasses in a row to our dog and have them indicate to us which one contains the apple. You can train this with a clicker - not necessarily though - but I will use the clicker in the examples. Introduce the apple in a glass. When your dog puts the tip of his nose in the glass, you click. Some dogs already got this in the first session. Others had some difficulty finding out what was expected. As an example, I took a video of the first session I did with Viva when we got home again. You can see she has no clue what I expect of her. When she shows stress by scratching herself I stop the session. We only click when they put their nose down in the glass. If we would click on licking or tipping the glass over, we might create the wrong behavior. 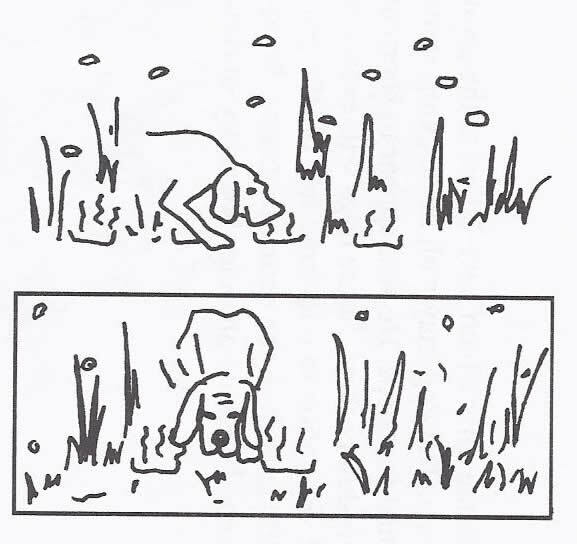 After step 1, your dog probably thinks this is the "put nose down in glass excercise", so we have to introduce scent into the equation. Now you use two glasses, one with the apple and one with a plum or an orange. They will put their nose down in both of them. You click when they are down in the glass with the apple. This will teach them it is all about the apple. Here a video with Kenzo I took on return from camp. He is still with this step. Can you see where my clicker timing is wrong? I was not a big help in this session for Kenzo. The last choices Kenzo made were very good! To rule out they chose by exclusion we delay the click. We now first click if we can see they stay with the apple, and they are telling us deliberately "it is this one!". First then we are sure they understood it is about the apple, not the glass or anything else they might think of. In the next video you can see Kiwi, she reached far and made it to this step already during the sessions on the nosework camp. There are three more steps to go through: 4. distractions, 5. mark and 6. cue - and we tell more and show video's with Kenzo and Viva when we get that far! It was very interesting to see all the dogs evolve through the steps. Kiwi made it to a first session into step 4. And one dog was able to demonstrate step 4 in its fullest. 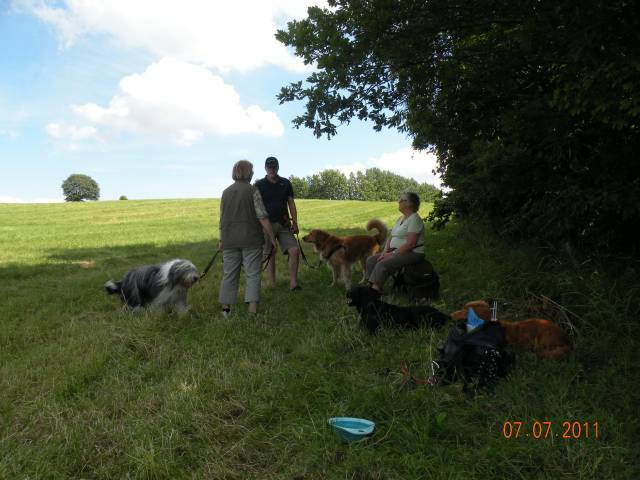 All dogs were able to leave the camp in step 2. That in itself is a very good result when you think the camp only took 3 days. It was awesome to see the differences in style between the dogs. Like Kenzo, who was carefully choosing his moves what to do, was in sharp contrast with Kiwi's high speed learning style. It is important not to go forward too fast. First when they got it right 8 out of 10 times they are ready for the next step. It is also best to start each session with a short repetition of the steps you already master. Like a short rehearsal. If they show any confusion, it is probably best to move a step back or start from the beginning again. Nosework tires. A session should preferably only take a couple of minutes, and they need a short break between each session. 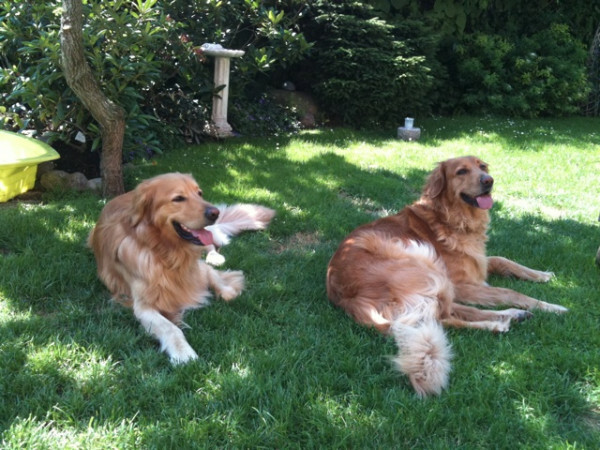 It depends on the indivudual dog, but with Kenzo and Viva I train this never longer than 15 minutes in all per day. As you know, Kenzo can already search for marihuana. We trained this in a different way, but as our trainer pointed out the method we used didn't address searching by exclusion. And there was a risk Kenzo used exclusion instead of scent. Terminally worried I used the first available break to hide some pieces of cloth in the stone wall at the entrance of the camp. Some with and some without marihuana scent. I was relieved when Kenzo quickly found the marihuana and ignored the other pieces. Now when I think of it, I left the pieces in the stone wall ... oh my. Searching for apples has its advantages. It is always nice when you know your blog is being read. Even better - for us - when we hear it is actually used by visitors to form an opinion on Hovawarts. Yesterday Kenzo and me returned from nosework camp. After three days of scent feast, my head is still spinning with all the info and advice we brought with us home. But more important, Kenzo is back on track! One of the main reasons we went on camp was because we made no more progress with tracking. Just recently, Kenzo missed his tracking exam as a result of that. And despite the advice we got from our trainers, we didn't improve. When we started on camp, I made a whole list of things that needed some work. And when Vibeke Gyldenkærne, the tracking trainer, started out by asking what issues we encounter on the track I spilled out my wish list. Without blinking an eye - to what for me felt like overambitious and mission impossible for just 3 days - she simply replied: "Lets solve that than...". Let me explain that Vibeke Gyldenkærne is one of the few - and maybe the only one - in Denmark that trains tracking solely based on positive reinforcement. And she has proved it works, as a multiple Danish Champion in tracking. In a world dominated - excusé le mot - by old school police K9 training, training with Vibeke is refreshing and inspiring. I noted that for each solution she offered for our issues, her advice was many times contradicting what our regular trainers advised in the past. But she was always spot on. She quickly find out what Kenzo needed and got him tracking again in no time. I am so thrilled. At one point, when Kenzo had to find a track, I thought he followed a wrong track and stood still. But Kenzo insisted! He didn't let go and was determined to follow the track. Vibeke was very pleased to see that. For me, it was awesome. But more about tracking soon. We also trained scent discrimination together with Charlotte Lyngholm - the organizer of the event as well. 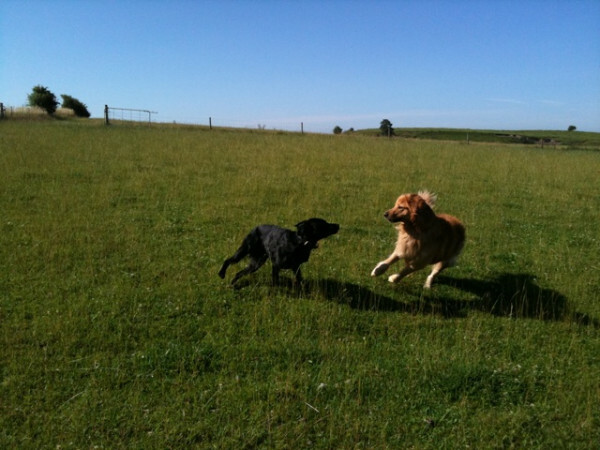 Like Vibeke, Charlotte has an impressive resume in dog training. In a country without certificates, Charlotte sets her own standards and studied behavioral psychology, is attending seminars and academy's in the US and Holland. In short, a lady with high standards. We should chose an item we would like Kenzo to recognize by scent. Either an apple, a tea-blend, coffee, or something like money, we could make our pick. Kenzo already knows how to search for marihuana, so we chose the apple. I was looking forward to see if we could make it in only 3 days. Marihuana took us a lot longer. If we made it, and how to start on scent discrimination with your own dog, is going to be part of the next installment, hang around!